We’re delighted to introduce this guest post from Tim Ayre, a current student on our Classical Studies MA. Tim teaches Classical Civilisation and English at a secondary school in Dorset, and is a recipient of the MA scholarships that we have been able to offer to teachers looking to introduce or enhance the provision of Classical Studies in their schools. This is one aspect of our role as a partner in the Advocating Classics Education project – watch this space for news of our 2019 ACE event, which we will be publicising very soon. 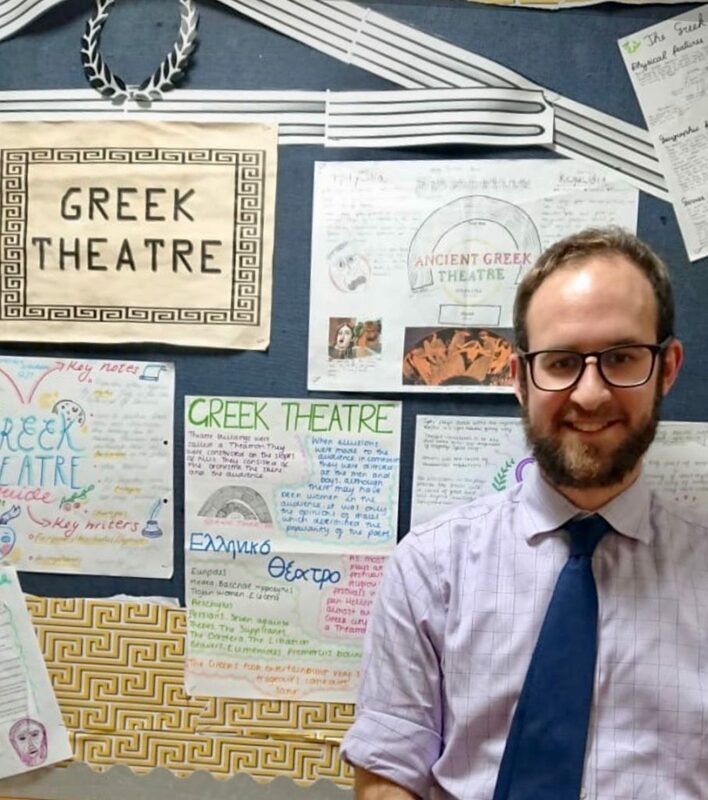 In this post, Tim explains how his work on the MA has helped him to develop his skills as a Classical Civilisation teacher. This entry was posted in MA, People, Postgraduate student profiles and tagged MA in Classical Studies, part time study, teaching on January 10, 2019 by Joanna Paul. We’re sorry to announce that our planned ACE (Advocating Classics Education) live-streamed event has been postponed, due to ongoing industrial action by the Universities and Colleges Union. Watch this space for details of a rescheduled event! Please direct any queries to Joanna.Paul@open.ac.uk or Virginia.Campbell@open.ac.uk. This entry was posted in Uncategorised on March 2, 2018 by Joanna Paul. In this post, John Teller, a recent graduate of our MA in Classical Studies, reflects on his experience. If you’re interested in finding out more about this qualification, visit our department website. When I came across the details for the MA in Classical Studies at the Open University, in 2015, I knew it was exactly what I was looking for. I had no background in Classics, and no experience of studying history (I’d previously studied as a scientist and a policy studies wonk), and to begin with, I was advised against registering. However, after discussion with tutors, I convinced them that I might make the grade – and in 2017 I completed the MA with a distinction! This entry was posted in Postgraduate student profiles, Uncategorised and tagged MA, postgraduate on August 22, 2017 by Joanna Paul. It’s not difficult to find a reason to visit the beautiful city of York, but for a classicist the city once known as Eboracum is a great place to spot some Roman remains. 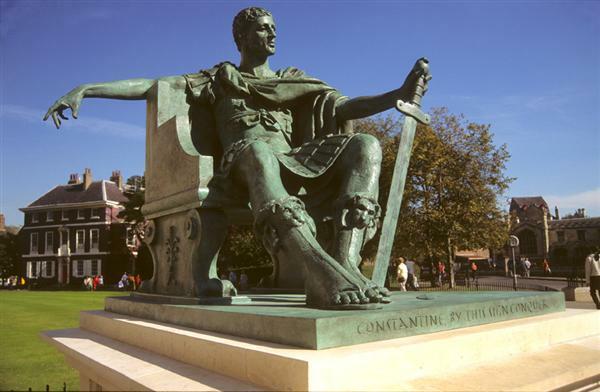 Try navigating your way around the city with the help of this Roman York walking tour and podcast; be sure to take a look at the city’s best preserved Roman fortifications and Roman coffins in the Museum Gardens as well as Philip Jackson’s 1998 statue of Constantine, the first Christian Roman Emperor. It’s also well worth dropping in to the Yorkshire Museum (where OU PhD student Adam Parker is Assistant Curator of Archaeology); the museum hosts, among many other treasures, a fine collection of Roman artefacts, including a mosaic floor. And if you visit York’s Art Gallery before October, you’ll find an exhibition of works by Albert Moore, many of which have a distinctly classical theme. York’s one of those places where almost every new building development turns up some Roman finds, but even those who don’t know one end of a trowel from another can get a taste of life as an archaeologist by visiting DIG museum, which gives children a chance to become trainee ‘diggers’. The city famously has 365 pubs, one for every day of the year, but if you’re after some refreshment in a classically-themed location the watering hole for you has to be the Roman Bath pub in St Sampson’s Square; its basement houses York’s Roman Baths Museum. My No. 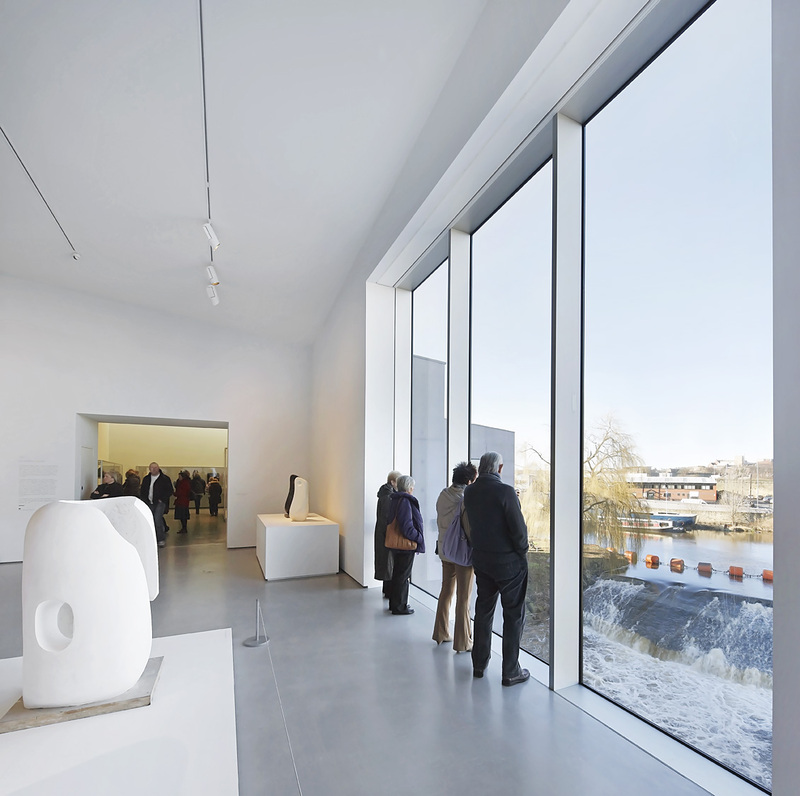 1 summer day-trip recommendation is the Hepworth Gallery in Wakefield, recent winner of the Art Fund Museum of the Year 2017 Award. The Hepworth Gallery is a really beautiful space, with its big windows looking out onto the canal and busy road beyond. 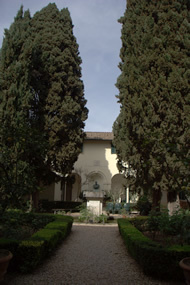 In addition to its temporary exhibitions (currently showing is Howard Hodgkin: Painting India), the gallery also has a unique permanent collection which includes works by Barbara Hepworth, Henry Moore and other modern British artists whose paintings and sculptures often resonate with classical antiquity in some way. When I visited last month, I particularly enjoyed looking at a display of ancient artefacts (including Cycladic figurines) that Barbara Hepworth owned, and at the new display of books selected from her personal library. These included an annotated dual-language text of Sophocles’ Electra, several other translations of Greek tragedies, and a number of books on Cycladic and Classical art. 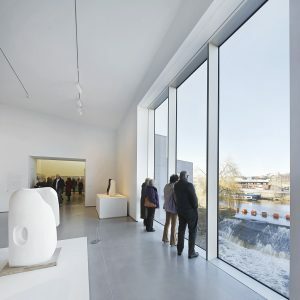 Wakefield is well-connected by train (approximately 2 hours from London), and you can get a taxi to the Hepworth from the train station. There’s also car parking over the road, and a very nice cafe and bookshop inside. The Hepworth Wakefield is part of the Yorkshire Sculpture Triangle, together with Leeds Art Gallery, the Henry Moore Institute, and the Yorkshire Sculpture Park. The National Coal Mining Museum for England is nearby. One of my favourite places to visit is Birmingham Museum & Art Gallery (conveniently located in the centre of the city, in easy walking distance from the railway stations) which houses a world-class collection of Pre-Raphaelite paintings, a group of works from the later half of the nineteenth century that drove against contemporary artistic trends through their admiration for medieval Italian art. Many of these artworks display clear affinities with the ancient world and/or portray famous classical figures. 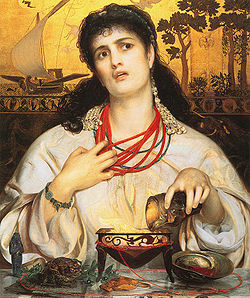 Indeed, be sure to catch Frederick Sandys’ arresting portrait of the magician and princess Medea (1868), which imagines the enchantress preparing a foul potion of magical ingredients. Amongst the many other highlights is Sir Edward Burne-Jones’ fascinating Troy Triptych (1872-1898), an unfinished work that represents several scenes from the Trojan War story. One of my holiday destinations this summer is Dorset; as a child, I spent every summer there, and I’m now looking forward to showing my own children the place that introduced me to ‘the Romans’ before I had any idea who they really were. There may not be very much to see at Maiden Castle, besides the vast ramparts and the minimal remains of structures like a 4th century CE Romano-British temple – but the sheer scale of the place (the largest Iron Age hillfort in Britain) is impressive. Walking across the ramparts and up and down the slopes (manageable by all but the most reluctant children!) affords spectacular views across the Wessex countryside, and it’s not hard to imagine the commanding position once held by this fort. As a child, I was captivated by tales of how Vespasian attacked it during the invasion of 43 CE, and though this version of events is now disputed, Maiden Castle still offers an intriguing and evocative insight into the earliest phases of the Roman conquest. The wild landscape of Maiden Castle can be placed in historical context with a visit to the Dorset County Museum in Dorchester (ancient Durnovaria), which houses many finds from the site, including some famous skeletons bearing the signs of injuries which may or may not have been inflicted by invading Romans. Also in Dorchester, you can visit a fully exposed Roman ‘town house‘. This entry was posted in Ideas on July 25, 2017 by Joanna Paul. 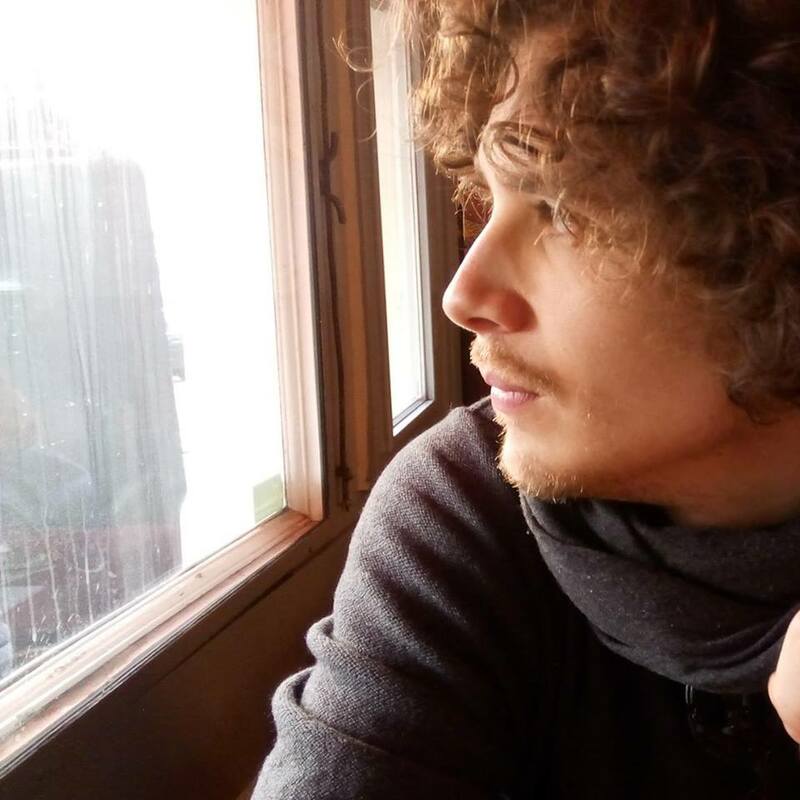 Carlos is spending the summer with us in the department of Classical Studies, as a Visiting Research Student. In this post, he introduces himself, and tells us about his research project. In the first pages of Promethea (1999), a comic book by the British writer Alan Moore, we meet Promethea, a young girl who lives in 5th century A.D. Roman Egypt. At the beginning of the story, she has been chased by an angry Christian mob that has just killed her father for being a ‘Hermetic’ philosopher. In the middle of the desert, a strange deity suddenly appears, introducing himself as Hermes-Thoth, and addressing the girl with these words: ‘Now everything is well’. This was my first contact with Hermetism. After completing my Bachelor in Classical Philology at the Universidad de Sevilla (2013), I moved to Madrid to do a Masters in Classics (2013-2014). There, I first encountered both Classical Reception theory and Hermetism. In my Master’s dissertation, titled ‘Prometheus in Feminine: Uses of Classical Elements in Alan Moore’s Promethea’, I studied the reception of the classical world in this comic, which masterfully combines mysticism, superheroes, science-fiction and fantasy, and I discovered that Hermetism was the main element of the classical world to be reimagined in its pages. Later, I started my PhD under the supervision of Prof. Luis Unceta at the Universidad Autónoma de Madrid. The title of my dissertation is ‘Hermes Trismegistus: from mysticism to fantasy. Survival of the Hermetic Texts from Antiquity to the present day’, and it focuses on the reception of the Hermetica in 19th to 21st century fantasy, occult and science fiction literature, in authors such as Edward Bulwer-Lytton or Alan Moore. But what exactly are Hermetism and the Hermetic Texts? The Hermetica, as they are commonly known, are a group of texts from the 2nd-3rd century AD related in one way or another to the wisdom and teachings of Hermes Trismegistus, a legendary figure resulting from the union of the Greek god Hermes and the Egyptian god Thoth, two popular deities which shared a similar set of attributes. The Hellenistic fusion of the Graeco-Roman and Egyptian worlds gave birth to a shared cultural milieu, which led to the apparition of this syncretic figure, part god, part prophet. The texts cover a wide range of subjects, and they have traditionally been categorized into two broad ─ and usually problematic ─ groups: ‘philosophical-religious’ and ‘technical’. Under the first label we find texts that exhibit a sort of knowledge in accordance with the Neoplatonic traditions of the first centuries of our era. The second label comprises texts dealing with alchemy, magic or astrology which, ultimately, are the foundation of our modern ‘occult sciences’. Although this categorisation is useful, it has been frequently challenged: religious and philosophical material is to be found within the technical Hermetica and vice versa. In the Renaissance, a Hermetic revival starring scholars such as Marsilio Ficino, Giordano Bruno or Cornelius Agrippa, who worshipped Trismegistus as a forerunner of Plato and Pythagoras, shone a light on the Hermetica, which were then profoundly reinterpreted. Hermeticism was again trendy for almost two centuries. Later, classical scholarship proved that the texts weren’t so old as first thought, and with the arrival of the Enlightenment, they were condemned to what we call Occultism, in the wide sense of the term. It is in the 19th century that the Hermetica are again recovered, this time by members of esoteric and occult societies such as the Hermetic Order of the Golden Dawn and the Theosophical Society, many of whom also happened to be literary authors, for example Arthur Machen or Dion Fortune. Thanks to the work of these authors, hermetically influenced ideas became part of the basis of the popular fantasy and science fiction genres throughout the 20th century. And that’s how we arrive at Alan Moore and other comic book authors. How does Hermetism and Hermetic ideas permeate modern and contemporary literature, and especially those genres? How does it intertwine with the formats in which it appears, such as comic books? How does the reception of Hermetism after the Renaissance work? How has it modelled our own perception of some aspects of antiquity? These are some of the questions that my dissertation poses, drawing on Classical Reception theory as the best framework to approach the ups and downs of a trend of thought traditionally considered peripheral to the canon of Classical Studies, and therefore highly neglected by mainstream research. I would like to express my gratitude to the Department of Classical Studies of the Open University and especially Dr. Joanna Paul for having accepted me so kindly for a research stay from July to September. I have just arrived and feel very welcomed already. I’m sure I am going to learn very much in the company of such an amazing faculty. I’m very happy to share these months with you all. Carlos can be contacted on carlos.sanchezp@uam.es. This entry was posted in People, PhD on July 12, 2017 by Joanna Paul. Registration – which is free of charge and open to all – is now open for our upcoming colloquium on Antiquity and Photography, which will take place on September 10, 2015, at the OU regional centre in Camden, London. Please visit the colloquium’s website for further details, or contact the organiser, Joanna Paul. This entry was posted in Conferences on August 17, 2015 by Joanna Paul. On Thursday 10 September, we’re holding a one-day colloquium on the topic of Antiquity and Photography, to be held at the OU offices in Camden, London. This one-day colloquium aims to provide a forum for colleagues interested in this area of research, in which any question or topic related to the theme of Antiquity and Photography can be discussed. 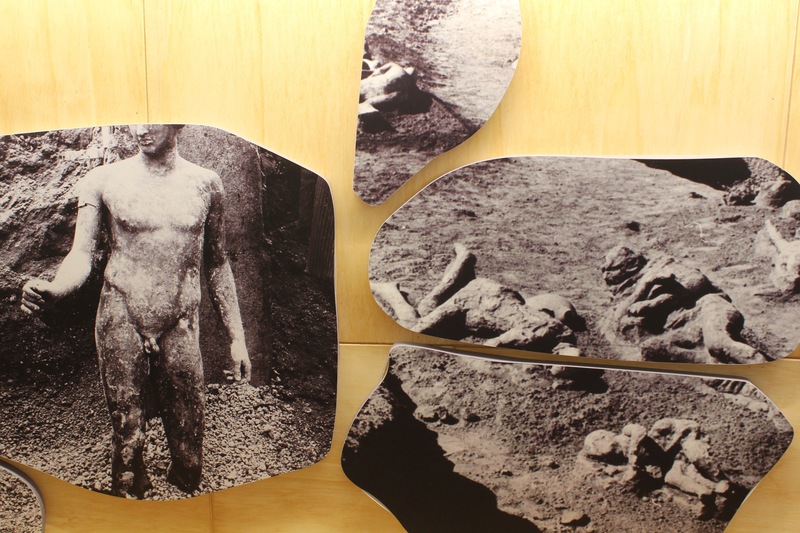 In particular, it is hoped that the colloquium will explore some of the more creative and/or subjective ways in which photography has addressed the ancient past, in addition to its use as a tool for documenting archaeological finds. Confirmed speakers so far include Zena Kamash (Royal Holloway), Joanna Paul (Open University), Shelley Hales (Bristol), and Katy Soar (Sheffield). Watch this space for a final programme and details of how to register for the colloquium! This entry was posted in Conferences on July 5, 2015 by Joanna Paul.